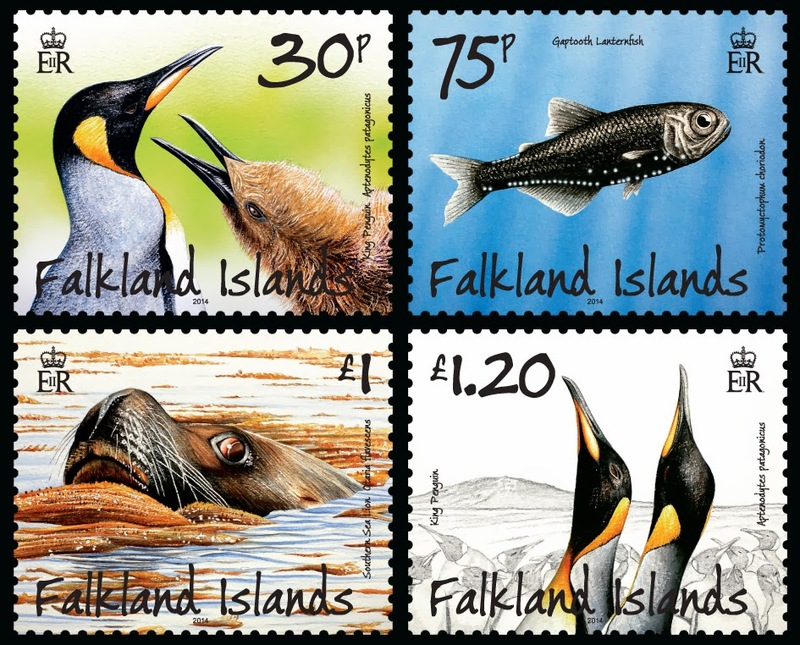 Penguins, Predators and Prey is a series of stamp issues featuring each of the familiar Falkland penguins, together with some of their respective predators and prey. This issue features the King Penguin. The King Penguin is the largest of the five species which breed in the Falkland Islands. They grow to one metre in height and weigh up to 16 kg. There are two subspecies: A. p. patagonicus breeds on South Georgia and the Falkland Islands in the South Atlantic. A. p. halli breeds on Kerguelen, Crozet, Prince Edward, Heard, McDonald, and Macquarie Islands. The world population is estimated to be 2.23 million pairs. King Penguins were one of many species encountered during James Cook's second voyage around the world (1772-75) in HMS Resolution. Johann Reinhold Forster was the expedition's naturalist with his eldest son, Johann Georg, as assistant and artist. Georg's illustrations included one of a large penguin with distinctive yellow markings, which they had seen on South Georgia in 1775. At first this bird was referred to as Forster's Penguin but later it became known as the King Penguin. King Penguins were once heavily plundered for their eggs, oil and fancy feathers. The few that lived in the Falklands were exterminated during Queen Victoria's reign. During World War 2, they once again began to breed at Volunteer Point in East Falkland. Seven decades later the Falkland’s population has grown to around 700 pairs. Most of these breed at Volunteer Point although there are now also a number of fledgling colonies appearing around the islands. King Penguins do not make a nest, instead, laying a single pear-shaped white egg weighing 300 gm which sits on their feet. It is sheltered by a pouch formed by a flap of abdominal skin. The eggs are brooded by both parents who swop guard duties every 6 to 18 days. Chicks are hatched out naked after 55 days and remain, warm and safe, on their parent’s feet for the following 30 - 40 days while they develop a downy covering. Growing chicks later begin to hang together in groups or "crèches". This allows both adults to go to sea on prolonged feeding trips. Adults returning from the ocean must be able to recognize their own chick so they know which one to feed. They are able to recognize the distinct individual call, and possibly also smell, of their own young. Fledging takes place during the following spring. Because of their large size, King Penguins take 14–16 months to complete their breeding cycle. Therefore, they can only produce a maximum of 2 chicks in every 3 years. This is the longest breeding cycle in the avian world. Over 80% of the prey caught by Falkland King Penguins during the summer consists of Gaptooth Lanternfish (Cherel, Putz, and Hobson 2001). Lanternfish are small mesopelagic fish of the large family Myctophidae. They are found in oceans worldwide and are among the most widely distributed, populous, and diverse of all vertebrates. They are aptly named after their conspicuous use of bioluminescence. In all but one species, a number of light-producing organs called photophores are found in ventrolateral rows on the body and head. The photophores are arranged in species-specific patterns. Lanternfish are well known for their diel vertical migrations. During daylight hours most remain in the gloom below 300 metres but at night the fish rise closer to the surface. They are thought to be both avoiding predators and also following the diel vertical migrations of zooplankton, upon which they feed. During daytime foraging trips in pursuit of lanternfish, King Penguins repeatedly dive to over 100 metres and are able to reach depths exceeding 300 metres. Night-time dives tend to be shallower and mostly under 30 metres depth. The average time for a dive is around 5 minutes. Otaria flavescens regularly predates upon all the different penguin species which breed in the Falkland Islands. In general it hunts along the shoreline, grabbing its victim in the surf or emerging from the waves to run it down on shore. The Sea Lion will then return to the water and shake its prey violently to remove the skin and tear it apart prior to eating. King Penguins are particularly vulnerable to this sort of attack as they are amongst the slowest of the penguins on land. The Southern Sea Lion is the most sexually dimorphic of all sea lion species. Adult males (bulls) can grow to over 2.73 metres long and weigh up to 350 kg. Adult females (cows) grow up to 2 metres long and weigh around 150 kg. In general it is only the bulls which predate on penguins. Otaria flavescens inhabits South American coastlines from Rio de Janeiro, on the Atlantic Ocean, southwards to the tip of South America, then northwards, along the Pacific seaboard as far as Peru. The Falklands’ population of Southern Sea Lions declined by 97% between 1938 (80,000 pups born) and 1995 (2000 pups born). The reasons for this extraordinary decline remain unclear but there is evidence to suggest that the population is now increasing. Breeding King Penguins are often seen stretching skyward and calling in what is termed the "trumpet" display. Males will perform this in the spring to attract a mate. Once paired up, a male and female will often perform the display simultaneously to strengthen the bond between them. The most complex displays and calls in penguins are those between two paired mating adults. These "display calls" convey territorial, sexual and identification information. Male penguins trumpet, bow and swing their brightly-coloured heads to communicate possession of a particular nesting site. Paired penguins perform similar mutual vocalizations to communicate their pairing, both to each other and also to the rest of the colony. These displays continue throughout the breeding season. The trumpeting pair of Kings in the illustration are pictured at Volunteer Point, East Falkland. The artist who also wrote this text, wishes to acknowledge the help of Joost Pompert of the Falkland Islands Fisheries Department during the production of this issue.